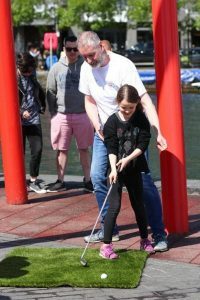 The 2017 Docklands Summer Festival celebrated the 221st birthday of the Grand Canal Basin in style with an exciting outdoor, high energy, positive lifestyle event for all the family. Many young families and outdoors type millennials braved the unseasonably cool and often wet weather to attend and participate. Benny Cullen, Dublin Waterway’s Ireland’s Docklands Programme Manager, conducted a survey of attendees over the weekend. It is heartening the response was very positive about the event with 100% of respondents saying they would attend again next year. 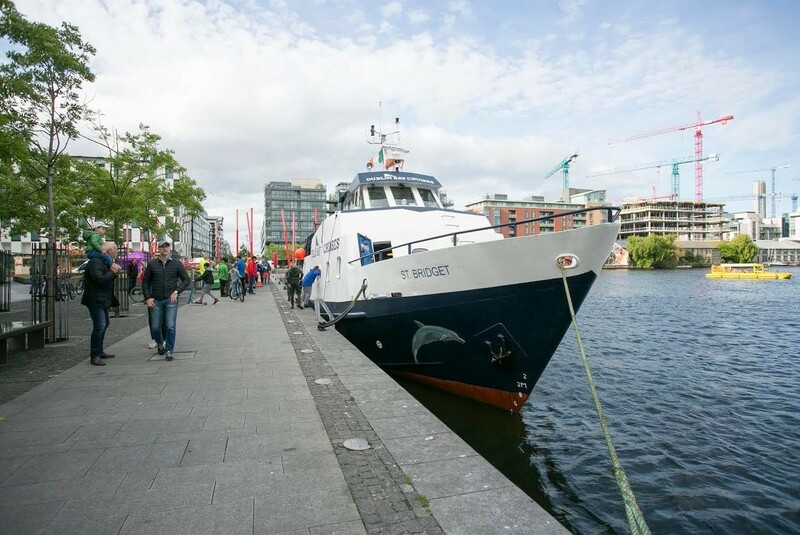 Dublin Bay Cruise picks up passengers during the Docklands Summer Festival. The first time in living memory a boat of this size has worked commercially in the Grand Canal Basin. On both the Saturday and Sunday the Saint Bridget from Dublin Bay Cruises (DBC) visited the festival at the conclusion of each day to pick up passengers for a tour of Dublin Bay. We are delighted the team from DBC’s agreed to participate this year as it’s the first time a vessel this size has plied a trade in the Basin in living memory. Such activity helps demonstrate the basin’s potential as a tourist hub and employment generator for what can be a wider maritime quarter for the city. 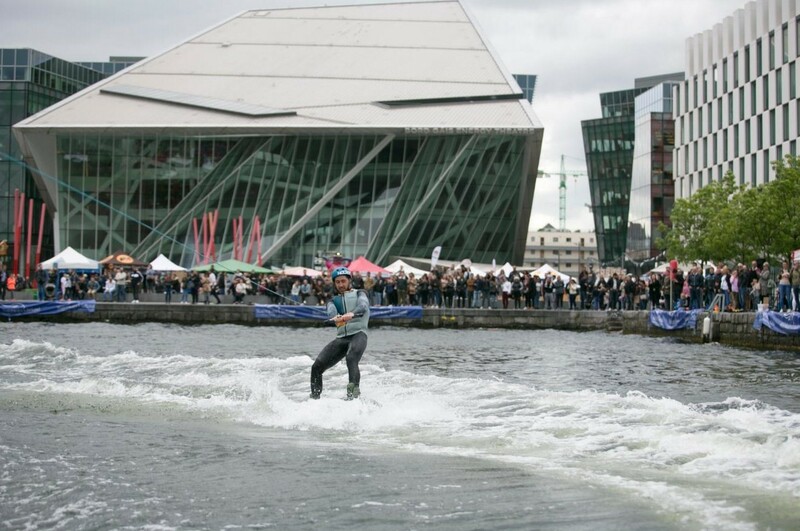 The Grand Canal Basin is an ideal venue for high-speed water sports in the centre of Dublin City. 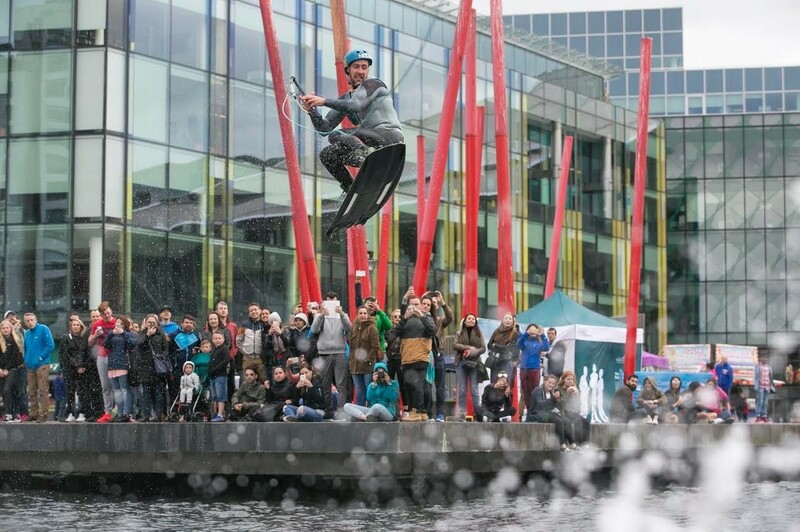 Pulled by a specially adapted Master Craft 7, Irish champion David O’Caoimh lead the wakeboarding team demonstrating one of Ireland’s fastest growing sports. A kicker was anchored in the basin to maximise the drama of this high octane water sport. The three forty minute demonstrations each day proved to be a big crowd pleaser. Each demo was introduced by a professional wakeboarder giving the audience an insight into the skills and speeds involved. Riding the waves. Paul Johnson from Belfast demonstrates one of Ireland’s fastest growing sports. Participation is an important aspect of the Docklands Summer Festival. We encourage people young and old to get involved with the weekend’s activities. This year we worked with our charity partners the Irish Underwater Search and Recovery Unit to present the Racin’ in the Basin raft challenge. Proceeds from the Rubber Ducky Race and the floating Golf Island also went to the IUSRU. Racin’ in the Basin. 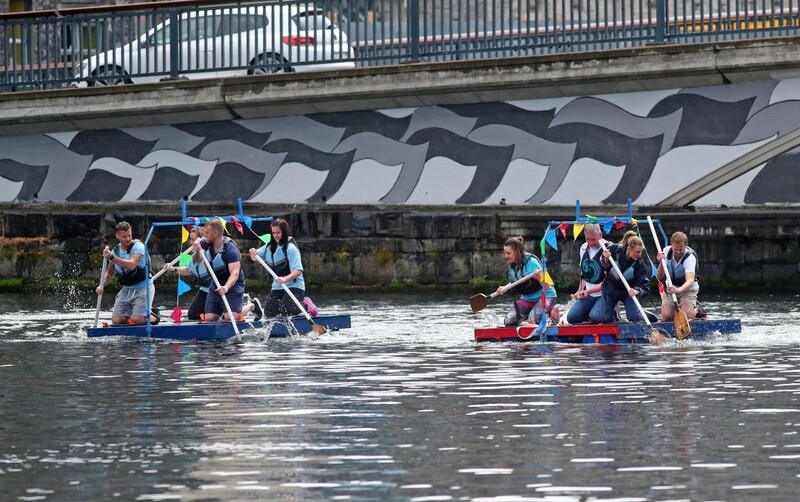 The local Bank of Ireland and Credit Union battle it out in the second heat of the raft challenge. The mural in the back ground was painted by volunteers from the Docklands Business Forum two weeks before the event. All these events and our Canal Barge Parade presented by our friends in the Inland Waterways Association of Ireland were held on the outer Basin. Many local businesses kindly provided prizes for our various events and online competitions, a big thank you to Surf Dock, the Gibson Hotel, Herb Street Restaurant, KC Peaches, the Grand Canal Hotel and Milano’s Hanover Quay. 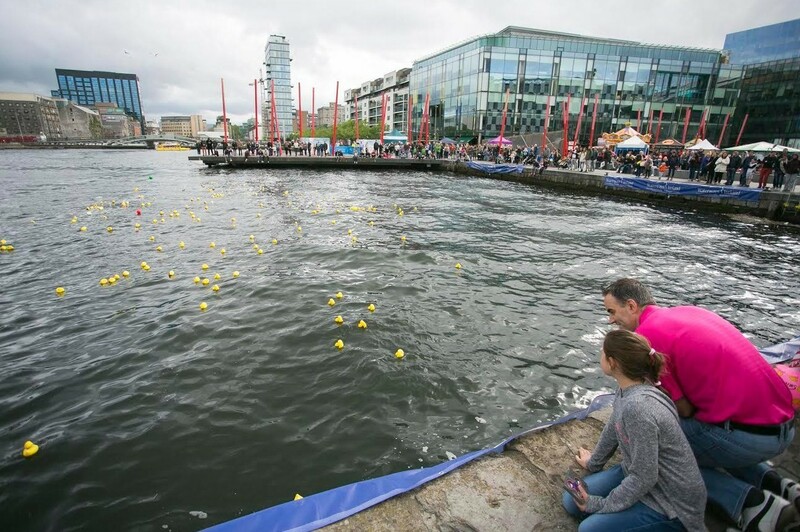 Our International World Famous Rubber Ducky Race is one of our most popular events. We held an extra race on Sunday to facilitate the numbers. Two key events were held in the inner Basin. Our friends from Waterways Ireland allowed us to use their Visitor Centre as an arts and crafts centre. Parents brought their young children to decorate their Rubber Duckies for the World Famous International Rubber Ducky Race. Surf Dock also helped us organise Come Try It Watersport Sessions on the pontoons in the inner basin. These sessions in kayaking and stand up paddle boarding were sold out each day. 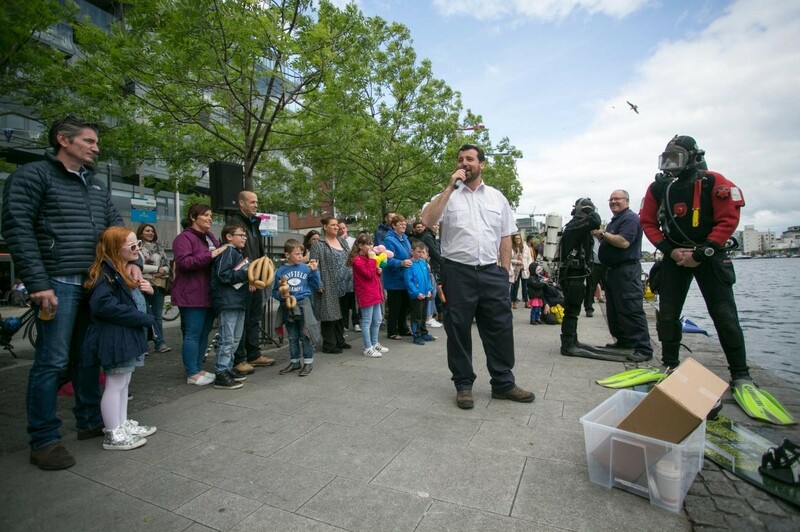 Our charity partner, the Irish Underwater Search & Recovery Unit, gave a demonstration each day. It Ain’t Easy! Landing a ball on a floating golf island is not the easiest introduction to golf. Ready to Race! 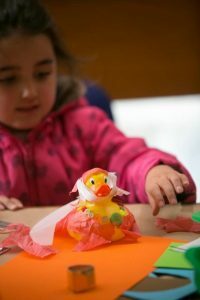 A duck decorated at the Waterways Ireland Centre is ready to hit the water. 2017 was a challenging year with weather and the Battle for the Bay, another great water centred festival, moving to our weekend because of the tide. However, we are delighted that over 30,000 people still chose to attend over the two days. The newly developed Grand Canal Square provides a uniquely modern and dynamic urban space. The local cafes, bars and restaurants, many of which face onto the water, provide wonderful al fresco facilities. These are complemented by our many on land activities located on Grand Canal Plaza.